The Legend of Zelda: Ocarina of Time did for the Zelda series what Super Mario 64 did for the Super Mario Bros. series. It successfully brought one of the most beloved game series in video game history into the magical new world of 3-D gaming. And not only that, but it added tons of amazing new game play ideas to a game that was already chock full of them. As with most Zelda titles, Ocarina of Time sold out across the world upon its initial release and stayed sold out at many retail outlets for weeks after its debut. So how has one of the greatest video games in history held up over the years and does it still have that special magic that made it one of the most successful video game titles ever made now that it's been released on Nintendo's Virtual Console service? Of course Link gets an updated play control system to go along with his 3-D visual makeover and the result is easily one of the most playable Zelda experiences so far. Link can still slash with his sword, but this time there's a bit more variety, not to mention the ability to target specific enemies. And it wouldn't be a Zelda game without the boomerang and bow & arrow, both of which Link can make use of in the game. Although the new 3-D look of the game does take a bit of getting used to, once you get a grip on it you'll soon find that Ocarina of Time is a real joy to play. You can map certain items and weapons to specific buttons which make them quite easy to get to in a pinch. You'll also find yourself roaming around the vast areas in the game on foot, not to mention horseback, which can make traveling longer distances much faster. The 3-D dungeons are also a nice surprise and add a much better feeling of exploration when compared to the previous 2-D Zelda titles. 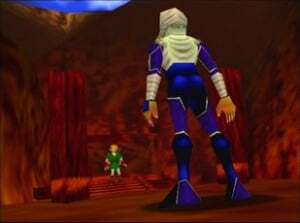 While many gamers wondered whether or not Nintendo would be able to successfully bring their much-loved Zelda series into the world of 3-D visuals that their Nintendo 64 console offered up, Nintendo once again succeeded with flying colors and changed the way Zelda would be played from then on. The visuals in Ocarina of Time might look a bit dated by today's standards, but there's no denying how impressive they were when the game was first released. Sure the polygons can be a bit jagged and the lighting effects aren't quite what we've become used to, but you'll still find moments when you'll catch yourself just marveling at what Nintendo was able to accomplish on the Nintendo 64 console and how great the Zelda universe looks in full 3-D graphics. 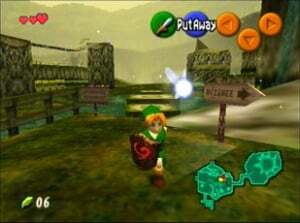 As with just about any game, there are some places in the game that look better than others, but overall Ocarina of Time is quite impressive for an early Nintendo 64 release and still holds up quite well all these years later. The amazing musical score has long been a staple of the Zelda series and Ocarina of Time is certainly no exception. The developers managed to not only compose some absolutely magnificent original musical tracks for Ocarina of Time, but also put together newer versions of the songs heard in many of the classic Zelda titles and truth be told, they've never sounded better. You'd be hard-pressed to find a track in the entire game that isn't catchy, and every track seems to carry the current mood of the game perfectly. Even the sound effects are impressively executed and make this one of the best Zelda audio experiences ever crafted. 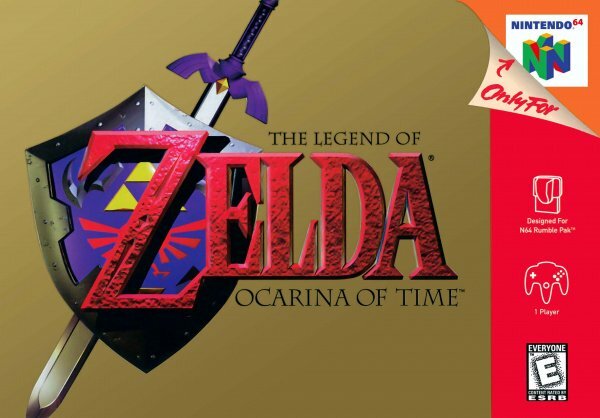 There's a reason that The Legend of Zelda: Ocarina of Time is widely regarded as one of the greatest video games ever created and it won't take you long to find out why that is. The game takes everything that was great about the Zelda series and somehow manages to bring it all into the world of 3-D graphics without a single hitch. Not only that, but the developers have also managed to add enough new elements to make the game truly stand out from the previous releases in the series. Ocarina of Time is honestly as close to video game perfection as you can get and an absolute must-play for any video game fan. Still one of the best games ever created. I've never played Ocarina of Time, rented it when I first had my 64, but didn't get much time with it as I was a outgoing kid. I'm buying this when I get home today. YAY! I would say this is the overall best Zelda. Twilight Princess had higher highs, but this is more consistent and it never drags. This and Majora's Mask are brilliant games even today and actually best alot of games that come out now. One of my favourite games of all time alog with the brilliant Majora's Mask. A Link to the Past, Ocarina of Time, Majora's Mask, Twilight Princess, I don't really know which is far better than the other. Sigh. There all great, to me that is. I never really played the portable versions of the Zelda games, which I never did before when I was born in 1995 (no, not 1985). The Wind Waker, The Minish Cap or Phantom Hourglass/Spirit Tracks on DS, haven't played those either. I might be getting a GBA for my birthday this year. My birth date is - October 02. The Mario and Zelda games are still brilliant, one of the best franchises I've ever played in the history of gaming. 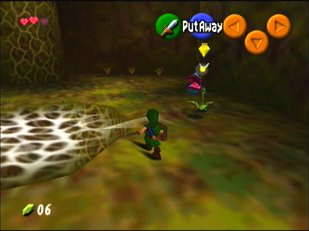 Later on, I'm gonna finish up A Link to the Past 100% completely and start this game all over, but THIS time, get the Deku Nut upgrade in the Lost Woods as a child FIRST before becoming an adult. @TankHowland Beware; someday someone will come out of the shadows and stab you with an N64 controller. THE FANDOM IS HARDCOAR. But yes, this game is awesome. Am I the only one who thinks this game isn't this great? I mean, it is an amazing game! But everyone says it's the best Zelda game but it's not. why such a low score? It deserves at least a 25/10! Great review as always corbie,even if the score is way to low! i'm not going to tell you im such a fan that i own all this stuff, or ive beaten every game, But i will tell you that I love zelda for it's overall brilliance and inspiration on my messed up life.... And that no matter what, Zelda will be the greatest series of ANYTHING on this earth. I would die for zelda, because for me it is not just a video game it is a way of life. And I know deep in my heart that ocarina of time is the greatest pop culture piece of the history of ever. More 8/10 if you ask me. Maybe even an 7/10. @SkywardLink98 sorry it isnt your precious skyward sword! This is the ultimate N64 title. From awesome sword and shield combat to good exploration, this makes this one of the best Zelda games of all time. Though I have some minor problems. There is no cursor to show where you are going to shoot with a slingshot or a bow. The camera gets a little frustrating at some points. Other than those two micro problems this is certainly a rewarding game. 9.5/10. Agreed with the comment on top. @undead_terror So am I, lol. Never really got into this one. @cheeseman Yo do realize what the memory pack was for, right? It increased the RAM from 4 to 8MB. Compare that with the Wii's 88MB Main memory. It has more than enough power to run an N64 game. @Cookieman336 I stopped playing the game around the fire temple. By then it felt like a chore to play. It's a good game, just not all that great. @cheeseman But both of those titles are available ^_^ Donkey Kong 64 came out a few months ago on the Wii U VC and Majora's Mask came out years ago on the Wii VC - I'm sure the latter will eventually arrive on the Wii U VC.